There are a thousand good reasons to have a small library of knitting books. They’ll teach you a ton, and you’ll always have resources on hand to quickly answer your questions. The internet is full of information, both good and bad, but in order to find it, you need to know what exactly to look for, the terms to use in your search, and how to evaluate the quality of the advice. Having a good selection of books on hand can speed things up. Reference books are dull and dry, but they’re also invaluable. My favorite knitting reference book was recommended to me by my aunt Lisa when I was a new knitter, and it’s The Knitter’s Handbook by Montse Stanley. It’s full of different ways to cast on, bind off, increase, decrease, and every other technique you can imagine. That’s what a good knitting reference book will give you– a lot of techniques and a lot of different ways to do them. Now, this particular book doesn’t always have the best instructions on how to work those techniques, but it gives enough information that you can decide which ones are worth trying, and then you know what terms to search to find a tutorial online if you can’t figure it out. The important thing is to have a resource that will expand your knowledge of knitting techniques so when a pattern says, “Bind off using a stretchy method,” you’ll be able to flip open your book to the bind off section and find 2-3 options to choose from in the stretchy category. I’d say about 75% of the pattern support questions I get could be answered in under 10 minutes if the person who asked had opened up a reference book instead of writing an email to me. Whatever your favorite object is to make, you should have a book on its construction. If you’re reading this blog, you’re probably a sweater knitter, but the advice holds true if you’re a sock knitter or a toy knitter. You should have a book on the basics of construction for your favorite kind of project. My go-to book on sweater construction is Sweater Design in Plain English by Maggie Righetti. If you’ve been reading this blog for a long time, you might have heard me complain about this book before. We have a love/hate relationship. This book is full of great information, and it’s the most well-rounded book on sweater construction I’ve ever seen. It covers pretty much everything you can think of, including short-row set-in sleeves. 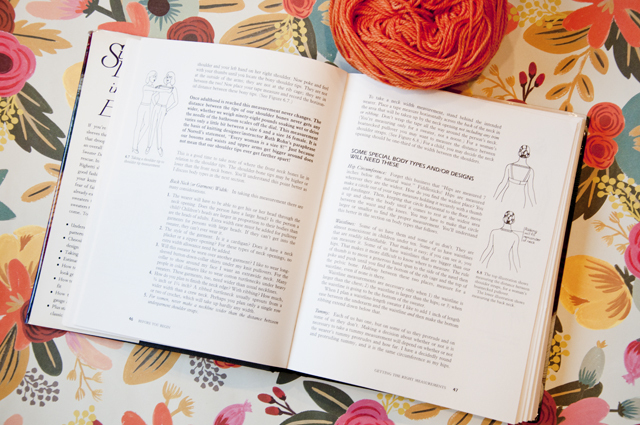 Even if you have no interest in creating a sweater from scratch, a book on sweater construction can help you better understand why you’re doing certain things while following a pattern, and that will allow you to make better modifications. That said, the author of Sweater Design in Plain English has an attitude about women’s bodies that makes me want to throw the book across the room. There’s a lot about hiding your flaws and disguising your body, and she gives some terrible style-related fit and fashion advice. If you’re confident in your personal opinions about fit and style so you can easily ignore the author’s and don’t have a hard time with body-image issues, this book is a great one to have in your library. If that’s not the case, I’d suggest developing a small collection of sweater construction books that were written more recently to cover a variety of different construction options without all the negativity. Yarn choice can make or break a project, so it’s in your best interest to learn as much as possible about it. 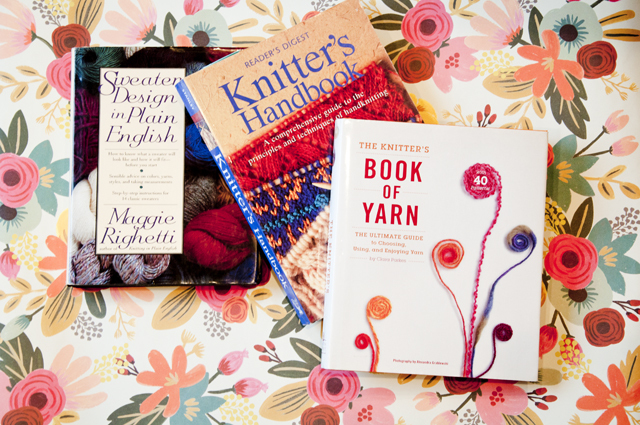 The expensive and time consuming way to learn a lot about yarn and fibers is to buy a ton of yarn and knit a million swatches, but it’s much more cost effective to just grab a good book. The Knitter’s Book of Yarn by Clara Parkes is my favorite yarn book. It goes into good detail about different fibers and their properties as well as yarn construction and how those things all work together to give yarns their unique characteristics. Simply understanding yarn better will improve the quality of your projects more than you might imagine if you don’t know much about yarn yet. Experience with different yarns is important, and there are always oddball yarns that behave totally contrary, but the knowledge you can get from a book will help you avoid some costly mistakes in the process of gaining experience. This book is probably the resource I recommend the most because a yarn book is usually the one that gets forgotten by knitters who are building their library. So much attention goes to construction and technique, but yarn is just as important! Really helpful, thanks! I’ve got the handbook and lots of pattern books, but will look out for a design and a yarn book! Both Maggie Righetti’s book and Knitwear Design Workshop by Shirley Paden get lots of use from me. I totally agree – there’s so much value in books that can’t be gotten from the internet. Most public libraries I’ve been to have a section for knitting books. They’re in the 746 Dewey decimal. Right now I’m reading The Knitter’s Book of Wool (another book by Clara Parkes) and Traditional Scandinavian Knitting by Sheila McGregor. It’s great to have reference and how-to knitting books, but my favorites are knitting history books like McGregor’s. They’re hard to come by, though! Ooh! That sounds like a fun book. I love knitting history books, too, and I agree that they can be hard to find. It’s unfortunate! Thanks for the recommendations. I am trying to gradually build my collection of knitting and crochet reference books. I think my library has the book on yarn. I will have to go check it out. Sweater Design in Plain English has also been on my to read list. Thanks so much. I do have several books. I must say that reading the patterns is one of my most favorite things to do. At least one of these will probably be my Valentine gift from my sweetie. Are you aware of any good books for men’s sweaters? Good recommendations! I’ve just sold off a book on stranded knitting that I bought when I was just getting into it – the mistake I made was buying a book full of projects when I needed a reference book. I realised I made the mistake when I took a look at how many stranded patterns I had used in this book (1, and I donated the finished hat because it wasn’t my style), and then compared to the number of patterns saved as favourites in Ravelry (well over 10). Meanwhile, my first reference book (Cast On, Bind Off by Leslie Ann Bestor) is constantly by my side, especially for binding off projects. The instructions aren’t always clear, but I’ve only found them unclear on one or two occasions and a quick look at YouTube has helped. Now, a construction book sounds like an excellent idea. Dry, as you say, but useful. Elizabeth Zimmerman, Ann Budd, and Clara Parkes’ books have helped me expand my understanding and ability so much that I feel like I owe them a debt. Zimmerman and Budd have really aided my understanding of construction while Parkes has really helped me understand fiber. I find their writing really engaging too, which can’t always be said for technical writing. June Hemmons Hiatt’s The Principles of Knitting is my go-to reference book. She analyzes everything, presents the evidence, and lets you make the choice that’s right for you and your project. From how to hold the yarn, to increase and decrease methods, casting on and binding off, working short rows, Hiatt explains things in concise and descriptive prose, helpful diagrams, and clear photos. 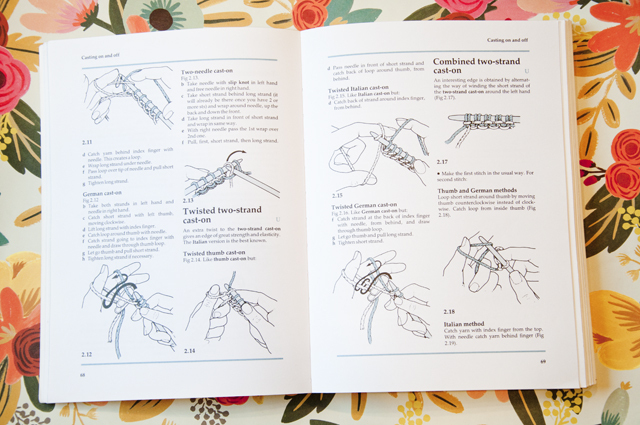 Barbara Walker’s stitch dictionaries provide so much inspiration for knitted fabric. Deborah Newton’s Designing Knitwear is a great resource for construction. Her latest two books (one on finishing and the other on fit and construction) are excellent reference works. Shirley Paden’s more recent book about knitwear design also has the advantage of being spiral bound, so it can be opened and laid flat. 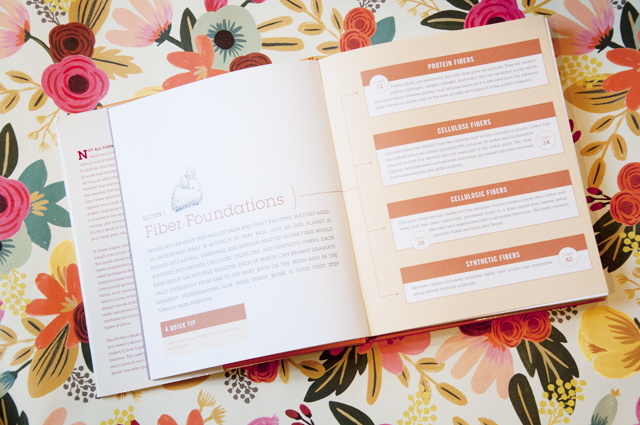 Another vote for the value of Clara Parkes’ books about fiber and yarn. I first read Maggie Righetti back in the late 1970s, early 1980s, when few knitting books were focused on construction. I found much of the information to be helpful, but somehow never purchased Sweater Design in Plain English. When I came back to that book after many years, I realized that Hiatt’s book was more comprehensive. Ann Budd’s books are great–useful schematics for sweaters (bottom up and top down), and for accessories like mittens, gloves, and hats. If you hate to do math to calculate stitch counts based on swatch gauge, Budd’s books have done the math for you. The Vogue Knitting Book is packed with useful information–about yarn characteristics, techniques, how to shape the knitted fabric, how to work a project–everything to help you no matter what skill level you have. Because Elizabeth Zimmerman wrote dismissively about knitting with cotton, I’ve never been her biggest fan (I love to wear and work with cotton yarns). But her books are essential reference works for anyone who knits.